Maruc quickly dashed the tear from his face and smiled warmly as colour returned to the dwarf. “What are we to do with you?” he grinned. “No!” he cried as the dwarf tried to sit. “You are in no fit state to move. I command you to rest. Halav has guided you back to the light but you must make the rest of the journey yourself. Be at peace. The others have given chase to Golthar, I have some magic left that will aid them. I must help them if I can. He is a dangerous opponent but I think this might help. He rubbed his stubbled chin in thought. Ludo’s instincts were right. Best not to rush into things, but he felt keenly the pressure of time. “For Feldard!!! !” the warrior bellowed as he ran heedlessly into what could only be danger. It was clear that he meant to topple the statues and scatter the bits. He was possessed. Any sense of reason had fled him after the seeing the fallen Feldard. Neither the elf or the human were all too surprised when the jade statues became animated and prepared to fight back. Maybe he was invisible, or hiding behind the portraits, Ludo frantically went to work searching for hidden doors and other exits from the room. The mage’s attention returned to his spellbook. It would be difficult to concentrate enough to cast a spell given the commotion. Then, he heard a voice somewhere in the background start to invoke a spell. Suddenly, three glowing arrows appeared in the room. Again, the voice shouted an arcane command and the missiles flew straight at him! The keen ears of the rogue triangulated the source of the voice. It was coming from behind one of the paintings. Another set of three glowing arrows appeared in the room, as Miklos writhed on the floor in pain from the first strike. Suddenly, the sound of his quickened breathing went silent. Yousef appeared before him carrying a copper coin. He was speaking, but the mage could not hear him. Miklos was a sharp young man though, and he quickly deduced that the coin had been dweomered. He pointed toward the statues and Yousef flipped the coin into the room. He looked in frightful anticipation at the 3 missiles in the air, but they did not move. Their enemy, this Golthar, was not able to complete his spell. After a few moments, the missiles dimmed and then disappeared. Breathlessly, Maruc made it to the top of the stairs in time to see the coin tossed into the room at the feet of the statues. He gestured to Yousef to go back to look after Feldard, Yousef nodded and turned to go. Raising his shield, he charged soundlessly into the fray. The statues fought ferociously with sharp claws. Stephan and Hasan had both sustained wounds, and were most grateful to see the cleric come to their aid. As one of the statues turned to face the new attacker, Hasan stabbed his sword directly into it. The statue cracked and then crumbled into powder. As all sound of battle suddenly stopped Feldard glanced towards the stairwell uneasily. The only noise he could hear beyond his own wheezed breathing, was descending footsteps – likely Yousef, but just in case – he would be ready. The dwarf glanced about for this battle axe, but could not see it. Dammit. It must have been left in the enchanted room. He unstrapped his crossbow and began loading it just as the figure of Yousef appeared in the far stairwell doorway. Feldard nodded to the unthreatening figure but continued loading his bolt. “On your way through the room, see if you can feel for my axe.” he called out to the former prisoner. He grunted with the effort needed to pull back the crossbow, then set the safety. Yousef had disappeared in the room. “Don’t dwaddle in your search. I’ll need your help walking.” He was loathe to leave his axe, but his friends might need him. He could always return and find it after the yellow-robed man had been found and dealt with. In a battle frenzy, Stephan fought on. The veritable explosion of one of the animated statues renewed his strength. “For Feldard!” he kept repeating as he dodged and parried the frightfully alive statue. The statue slashed at him and Hasan with mechanized efficiency. Stephan felt a massive impact from the thing’s claw. A searing pain followed the impact. He wheeled and managed to slam the statue with his shield. The animated stone possessed an incredible mass and was not easily toppled. But his shielded body slam caused at least a hesitation in its attack. A hesitation which afforded his fighting companions an opening. Hasan rejoined the wordless, soundless fight. Seeing the man entangle himself in the statue, he waited for the perfect moment. When the jackalman’s head lifted up in exertion, the elf’s sword whistled horizontally, carving a gleaming arc through the air, punctuated by a shower of quartz-like at its apex, where the sundered neck had been. The statueman collapsed, and Stephan drove it into the ground. Fixed the time to a.m. Thanks! Miklos ached. The viscious blow from the first magical assault had taken him off his feet and almost dashed consciousness from him. His head swam for a moment as his body registered the burning puncture holes. Thankfully his sharp cry silenced by Maruc’s spell. Still he didn’t doubt the wisdom of the cleric for an instant the spell had saved his life. He looked down at his robe. He sighed, that was going to take some fixing. He slumped back against the wall. He felt far too shakey to stand. Maruc spun to face the other foe in time the see it stumble. His chain flail arced again and again spraying splinters of pink stonework about the room. What dark power that had driven this creature was fading from its eyes and soon it was simple masonary. 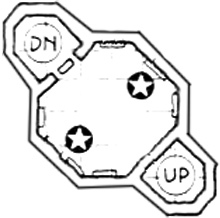 He caught Hasan’s attention and guestured him to help Ludo look for a way forward – the most sensible place to start being opposite to their entrance point as all the previous room in this tower had been designed. He then went over the Miklos and checked his wounds. It was fountunate Yousef had got here in time. Things could have turned out very differently. He spent a few moments binding Miklos. The scotch marks left very little to sew so he did what he could and knew without the aid of Immortal Halav this man would surcome to infection. He hoped Ludo would find a way forward soon. He didn’t like the idea of another trap. OOC – Sorry for the delay – been travelling. Ludo rushed through to the back of the room where he has heard the sounds of magic being invoked, doing his best to avoid the manical statues. Behind a painting he saw him, the evil mage, with terror on his face, from being discovered or realising that his magic would not work from the enchantment placed within the room, Ludo was unsure, but he did not hesitate. From habit, Ludo yelled “Surrender you fiend”! and was a little surprised that he did not hear his own words. Seeing the mage reach for his dagger, Ludo engaged him in combat, focusing on disarming the mage, deciding that Miklos and the others would like to question him, before handing him over to the authorities. Even though it had been a long night, Ludo felt calm as his training took over, remembering the lessons from his sword master, when facing a dagger, use the advantage of your weapons reach to maximum effect and always watch the shoulder not the hand. Ludo feinted to the left, pivoted to the right and slashed his sword, cutting the mages arm forcing him to drop his dagger. DM – leave it up to you, if he surrenders or not.